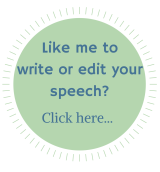 These public speaking anxiety tips were sent in from the visitors of best-speech-topics.com. Thank you so much for participating and making Best Speech Topics the place to come to discover what you need to be a better speaker! Read the tips below to help you overcome your public speaking anxiety and then submit one of your own! Tip From Katie: First, I have to always wear flats because once my tortoise high heel got caught in the stage and that was a horrible experience. Shook like a leaf and never recovered. I deep breathe and practice. I take any small speaking commitments I can which makes the bigger ones seem less stressful. Tip From Katie: Pretend Not To Be Nervous. Be confident and smile! Tip From Fionna: If you know that your friend is in the audience and they're going to laugh, whatever you do DON'T LOOK AT THEM. You'll be overcome with laughter yourself! Tip From Dexter: Practice your speech and be calm. Tip From Lacie: If you can't stand looking at people directly in the eyes, look at them in the little area between their eyes (right above their nose). Don't worry. They won't be able to tell that that's where you're looking! Tip From Mary: I thought the best tip was looking at yourself in the mirror and continuously read your speech over and over and try to get over your anxiety. Thanks!! Tip From Jessica: Practice reading out loud. You need to be confident with hearing your own voice. Practice breathing as you speak so you don't pass out while you are speaking. Tip From Anonymous: The most important thing that you could do before a speech is to have trust in yourself. If you trust yourself, you SEEM more confident. Also, you ARE more confident and speak slower. So, have trust!! Tip From Maria: If you don't know what you're talking about fake it and talk loud!!! People usually don't listen to your words but they hear your voice. Tip From Anonymous: Hold on to something. Paper clips tend to work for me the best. Transfer all of your anxiety into that object. Tip From Anonymous: If you really can't look at people while you are presenting your speech look at the wall at the back of your classroom or the desks at the back. Whatever you do...DO NOT STARE AT YOUR TEACHER THE WHOLE TIME! Tip From Ryan: Pretend like you're just talking with your friends, add some pauses between important sections of your speech... so people can get the message... and you can can take a breather. Just have fun with it, like you're a famous person presenting a new song you just wrote. Nobody else knows your speech so if you mess up just keep going, or add some new words to still transmit the message, but in another way. Tip From Sondra: Just do it... you must believe that you can deliver. Calm yourself and do it. Tip From Amanda: Just picture everyone in their underwear! Tip From Anonymous: I like to eat cheese before a presentation, it helps me concentrate on my topic. Tip From Anonymous: Distract yourself from thinking about your nervousness or anxiety and the most important time to do that is around that time when you start feeling butterflies in the pit of your stomach. Distractions may include running a damp napkin over the back of your neck or causing slight pain to yourself like pinching your hand as you keep it hidden from the audience (inside the podium for instance). Tip From Taylor: If you can't look at anybody, just look at the wall behind people, right over their heads. Do a slow little 180 degree turn, while speaking, just above peoples head, like you were sweeping the room and actually looking at them. Tip From Eddy: Practice makes perfect! If you get to rehearse the material to be presented, you will get to know it so well that words will flow out of your mouth! and Please, do not apologize for mistakes you might make. People may not even notice them. Tip From Luna: Imagine you are alone and that people around are just objects. At the start, slow down until you feel at ease. Focus on your speech and deliver it the best way you can. Tip From Zoey: Focus on someone you feel safe reading to, that should calm you down quite a bit. Tip From Annie: Take deep breaths before speaking to calm yourself. Tip From "sum1speshel": Take a deep breath and look at the wall or area behind the audience. Don't worry, they 'll never know who you are looking at. Tip From Brett: Know your speech subject. If you know what you're talking about, that's half the battle! Tip From Alex: If you feel like laughing, look at someone you really dislike.That will sober you up. Thanks for the great tips! Keep them coming!